Only FIVE days left till SPX! Can you imagine? What happened to the last two days, I hear you cry. Well, my dear readers, I was updating social media so much I completely spaced on the fact that it didn't update this beautiful blog. And in case you're not following my every move via Twitter, Facebook and/or Instagram (feel free to do so!) here are some highlights from Saturday's Assemblathon and Sunday's Don't-Touch-Me-I-Hurt-Everywhere-Recoup-Day. I got us up and moving to get an early start on the day. Despite Kyle's repeated protestations that we wouldn't need to go early because it's only going to take us a few hours, I insisted that we leave our neighborhood around 8am with the hopes of getting started around 9am. 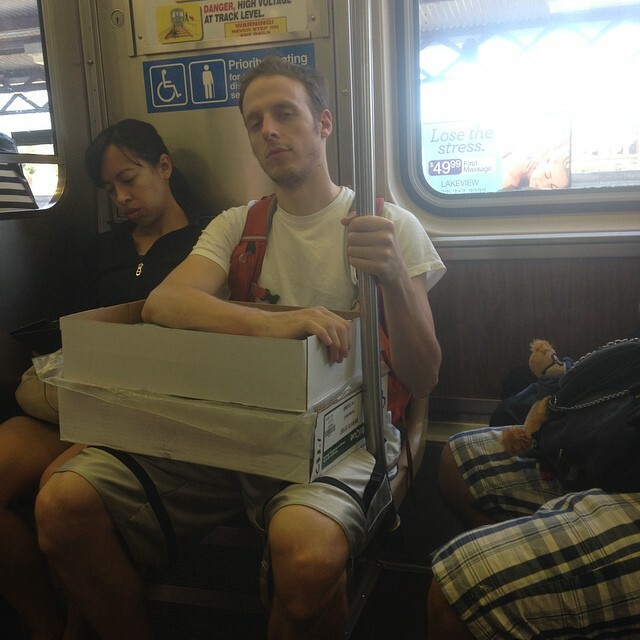 Here is the train ride as Kyle does his job of "carrying things." This is all the pieces laid out for us to tackle in a good work flow. 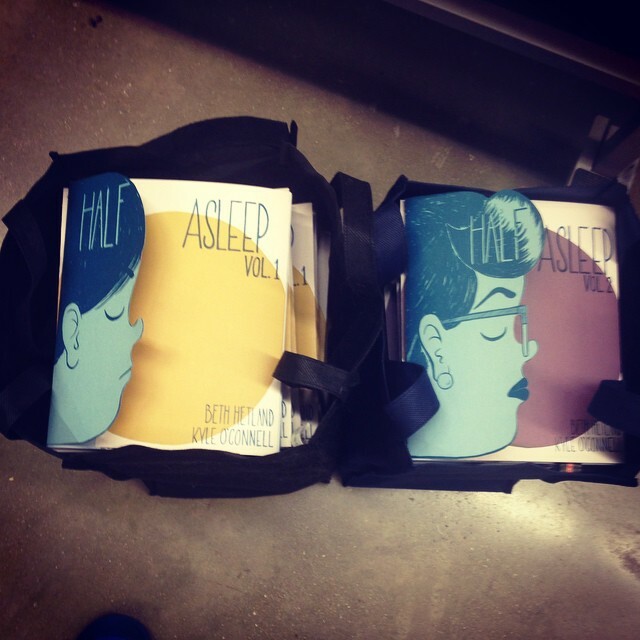 Although there are only three volumes, we were putting together 250 copies total. 100 of volume 1 (we only had about 25 left from our last print run, THANKS! 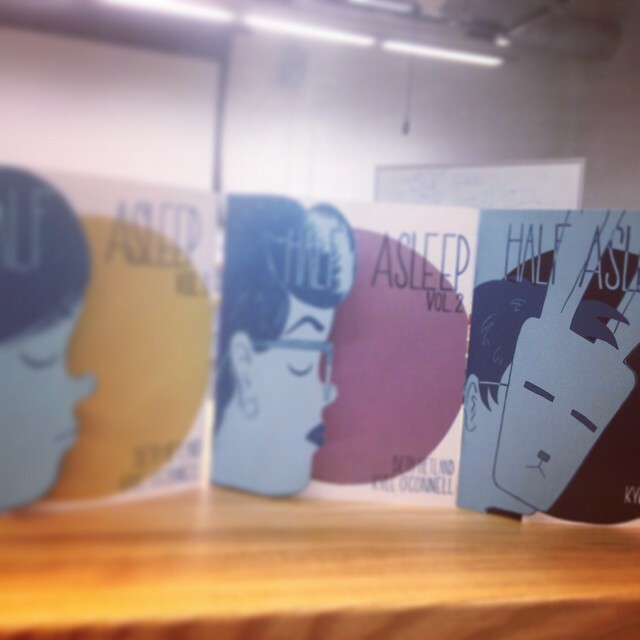 ), 100 of volume 2 (which was COMPLETELY sold out and never even made it to the online store, THANKS!) and 50 of volume 3 (which is our standard practice in case there are mistakes [always] and to test the audience interest). We had finished cutting out all the faces, but had not had time to score all of our fold marks. Plus each issue has its pages printed separately due to the mix of color and black/white pages. Black and white printing is SIGNIFICANTLY cheaper, so we print those separate to keep costs down. 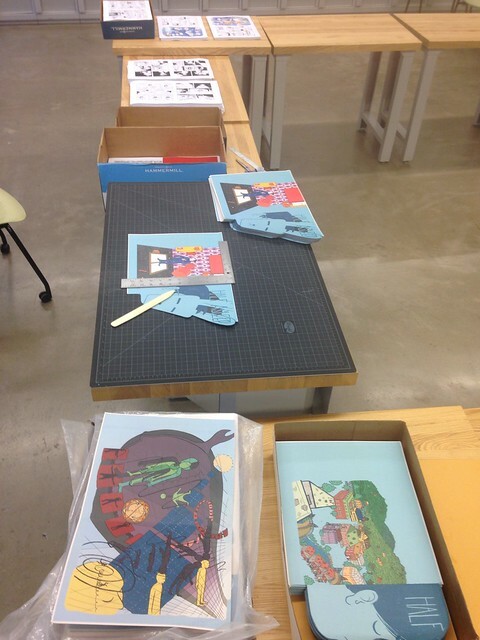 However, this means each issue must be hand collated. If you've never collated something, you may not understand why this one step takes almost 45 minutes by itself. Set up, and walk-through. 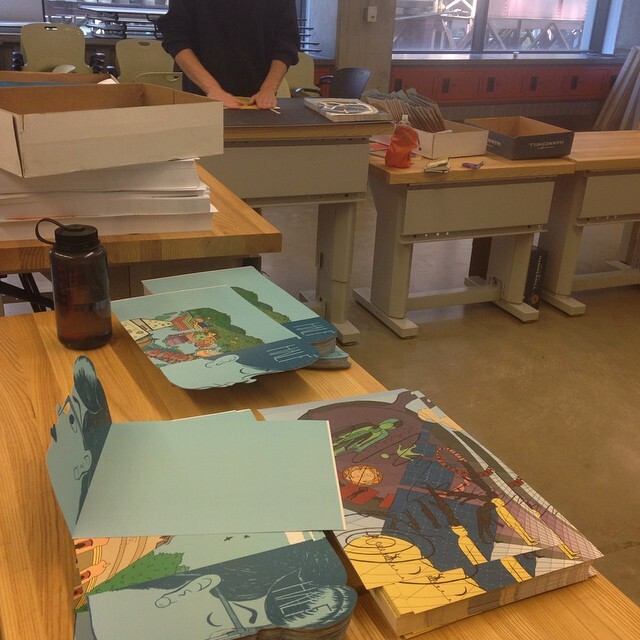 Here we are still scoring covers, and folding them to make the stapling process easier. As well as stacks of white paper which have now been collated and trimmed to the correct size. This photo looks like it was taken around 11am or noon. Not even half way through our day. You can see there's still a lot of stacks and no finished books. 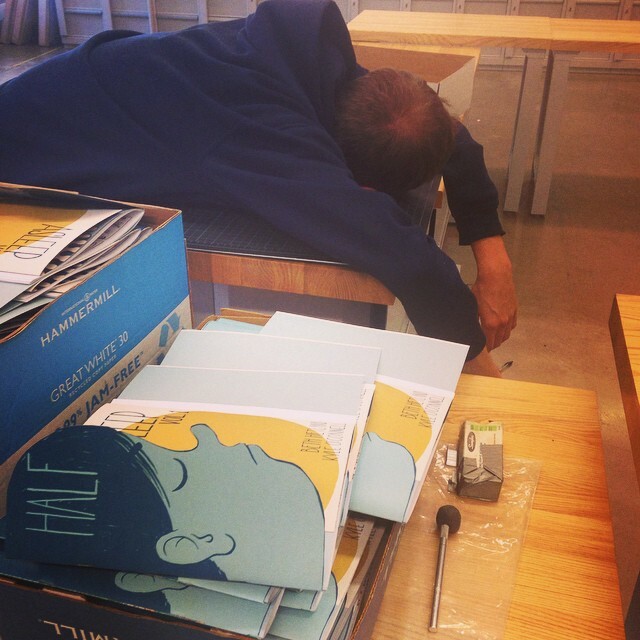 Kyle taking a quick stretch break after finishing stapling all 100 copies of Volume 1. After they are stapled, if you look closely they are still not the right size. That's because each one gets an individual face-trim (cut to make it the correct size where you would flip through the pages). We do this because not only are the covers complicated, but we want to make sure that when you get the final product, it looks nice and tidy and doesn't have rough edges where your fingers go. Sometime between noon and 5pm we finished volume 1 and were in the process of face-triming volume 2. I'm not sure when exactly it started to get hazy right around then as we had been standing, singing, and making books for almost 8 hours. Simulataniously working on various stages of each volume so that we never had a point where only one of us was doing something. The time flies by even though it's a long days work. Lots to chat about and sing to helps! At 8:20pm we finished cutting the very last copy of volume 3 to the song "Final Countdown" and it couldn't have been more perfect. We packed up, ordered a pizza to be delivered to our apartment building and magically ended up on an express train home. By 9:30pm we were stuffing our faces with stuffed crust pizza and chatting with our partners. What a LONG DAY! I don't have any documentation of how sore and tired I was on Sunday, but I'll tell you this, I slept in till 10am, woke up to go out to breakfast and then went back to bed until about 3pm, played some video games and called it a night at 9:30pm. Sorry for the delay! But I'm really excited for SPX and I'll see you there!